Way Hostel i Madrid, Spanien: Reservér nu! Oversat af Way Hostel er inden for gåafstand af de fleste seværdigheder i Madrid og er tæt på ugentlige Rastro marked, Puerta del Sol, La Latina og Plaza Mayor. Hostelworld gæster ofte anbefale dette vandrerhjemmets gratis ture som en "fantastisk måde at se byen", siger de er "virkelig nyttige for dem, der kommer til Madrid med ingen idé om, hvad de skal gøre". Vores gæster har også rost personalet for at være »yderst hjælpsomme og [har] en stor viden om byen«, siger vandrerhjemmet "giver dig et indblik i Madrid« og er »mindre end 300 meter fra en metrostation, men i en sidegade, som gør det meget quiet '. We're located in the quiet neighbourhood of Tirso de Molina, just around the corner from Puerta del Sol, the neuralgic centre of Madrid. 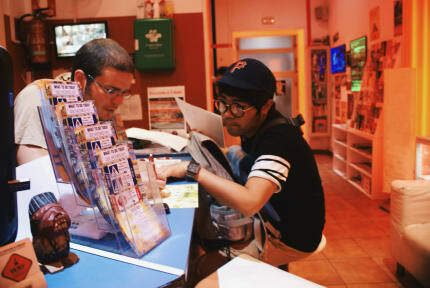 We have selected our location in order to have all of the main touristic spots in walking distance to the hostel. in this beautiful and walkable city. Close to traditional markets such as San Miguel or El Rastro flea market on Sunday mornings, the hostel is not more than a 15 minute walk to the Art Triangle: Prado, Reina Sofia and Thyssen-Bornemisza museums. The first idea for the creation of Way Hostel took place in the summer of 2008. By that time, there was not even a name, just a place that appeared to be ideal for our goal, the one that involved opening a new concept hostel in the city. We only knew the name should have 3 letters and rooms should be wide and diverse, because the new type of “backpackers” coming to town were not satisfied with the cheap accommodation that existed in Madrid. With all the will, and dreams ahead, we began to reform the building and create the first strategies to develop what soon became the best hostel in the city. A great place, with a great name and a great location was not enough, so our next move was to build up a young and multilingual team with ambitions. Today, after more than 8 years, Way Hostel turned out to be the best location in its category, making it the perfect spot for great memories to more than 200.000 guests that have given us a chance. Once here, you will be the judge. Our motivation has been, and will always be the same: it is important that you come, but far more important that you come back. This is why we offer a huge variety of rooms and prices, activities and services that will assure a great stay. From double private rooms ensuite to large dorms and only female dorms; from free, to “backpacker´s” price activities; from Spanish, to South America members on Staff; once here, you will never want to leave! And if you are planning a group trip, with friends, family, uni or whatsoever, we will offer the value for the money of the market so you can enjoy everything else Madrid has to offer! We offer a wide variety of activities including a walking tour, tapas tour, cheap dinner in the house, pub crawl and a Flamenco show. We also organize 'milongas', the famous tango dance celebration, every Saturday night at the hostel free of charge for our guests! So if you happen to stay during the weekend, you should try out your dancing skills! Almost 9 years has gone by since we opened, so we thought it was time to update our facilities and fulfill our customer´s needs, keep up with the new competition in town and give a nice design to our common areas and rooms. Now we are proud to welcome you to the new WAY, same location, same spirit, with newly refurbished common areas and facilities, reading lights for each bed, individual sockets, new and modern lockers and an even greater atmosphere with super high speed Wi-Fi. Jeg var utrolig glad for at bo på Way! Et stort, behageligt hostel med god atmosfære og venligt personale lige i byens centrum. Jeg boede på det eneste værelse uden AC, men det skulle da også være den absolut eneste finger at sætte på det - alt andet var værdi for meget få penge! Klart anbefalelsesværdigt. Great location, the staff are nice but the hostel is not clean, the bathrooms are disgusting and it seems like they don't clean the floors too in the hostel. The staff is really friendly and helpful, the hostel has a good atmosphere and the perfect location. On the downside my bed was not clean when I arrived and had to ask twice to get the sheets changed. Also I'd recommend you to bring a lock to keep all of your stuff in the locker as I had some of my clothes stolen at my dorm. Oversat af Vi interesserer over alt andet om vores gæster og deres behov. Vi generelt tiltrække folk i alderen 18 til 60 år, der har en god vibe og er åbne for at møde andre ivrig rejsende. For sjov, vi gør pub kravler, en tapas tour, paella nat og drikke spil, eller vi går ud til de nærliggende natklubber og barer. Nogle gange kan vi bare slappe af i vores nyligt renoverede lounge. Jeg tror, ​​vi virkelig tilbyde den bedste værdi for pris i Madrid, fordi vi har fået store, comfy værelser og masser af badeværelser. Vi er ikke mere end 15 minutter væk fra Sol, Rastro Marked, La Latina, Retiro Park, det kongelige palads, Gran Vía, Plaza España og Plaza Mayor, men det ene sted jeg plejer at anbefale, at folk ser, er den Templo Debod.